I struggle to define what Postmodern music is. I associate the genre with longer tunes, mainly instrumental and more jazz like than, say, Prog or Psychedelic. In spite of my conceptual difficulties, here is a whole mix of tunes with a postmodern vibe. Chasing Rainbows from Epic, a 2012 collaboration between Ulrich Schnauss and Jonas Munk, two German producers of note. 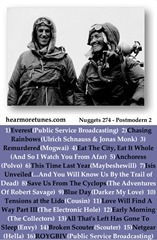 Remurdered from Mogwai’s 2014 album – Rave Tapes . I saw Mogwai recently. Very loud. Nothing else to add. Did I mention that they were very loud? Eat the City Eat It Whole by …And so i Watch You From Afar, the last track from their self titled album of 2009. Instrumental rock with lots of sonic variety. Anchoress by Polvo from their 2013 album, Siberia. I can’t find any clips of this tune, but here’s a clip to give you the vibe of this 1990’s band which recently started playing live again. Save me from the Cyclops by Robert Savage from The Adventures of Robert Savage Vol.1. This is an obscure band from the 1970’s and no, there wasn’t a volume 2. I am probably tipping over into Prog, so what. The Electronic Hole – Love Will Find A Way (part 3) from The Electronic Hole – The Electronic Hole (1970). Another obscure band. Envy – All That’s Left Has Gone To Sleep from Abyssal (2008). Japanese noise merchants. Move over Mono. Different song follows, but you get the idea. And this what they look like live.